Memorial Day Paddle 2014 - Dead Horse Bay (plus why my first sail got postponed until next week and why I was a little bummed about that - they had fun!). Summer may not get here for a couple more weeks, but the holiday weekend offered a preview - it was a fine weekend to be on the water. I thought I was going to get in my first sail of the season on Sunday; it was going to be a race, which isn't my favorite thing for a first sail of the season, but I was going to go anyways, the forecast was for fairly light winds so it wasn't like some first-sail-of-the-season brain fart was going to send me rocketing into another boat at a speed likely to cause damage. Besides, there'd only been one other Sunfish in the spring series so it was going to be more fun for him if I turned up. Unfortunately Friday was the day that our sailing google group decided that I was a spammer, so my request for a ride didn't get sent out. I sort of realized it but I wasn't organized enough to check with Holly the Sailing Co-Chair, who's also our communications officer - I also wasn't too worried, skipper's meeting was at 11:30 so there was plenty of time to catch the bus to the club. Except that the bus didn't come and eventually I got frustrated and went home. I'd had a fairly busy Saturday, I'd just unwrapped my living room after a fairly drawn-out wall repair and the thought of going home & just spending the day reading a book and dozing in the embrace of the Evil Futon of Nap was very appealing, plus there was laundry to be done and dishes to be washed, so in the end all that won. It turned out only 3 people showed up to race, but it would've been very entertaining as with a fleet consisting of a Laser sailed by an experienced racer, a less experienced sailor using a Laser with a radial rig, and another pretty experienced guy in a Sunfish, Holly, who was the Principal Race Officer (and in fact probably the entire race committee) set about coming up with some handicaps for the fast guy to even things up a bit. Twelve tacks on the upwind leg, fifteen jibes on the downwind, a 360 here, a 720 there, how about a figure eight before he's allowed to round the last mark - she was telling me about it on Monday and it sounds like she had a really good time trying to keep things lively for him, and she said she did a pretty good job of getting the finishes to be reasonably close affairs instead of a series of routs. My first sail hopefully won't be postponed for too long. This coming weekend is the first casual cruise of the season, as long as the weather's reasonable I'll join in on that, that's a great way to start the season, nice and laid back. And I did have a really nice relaxing day at home, and I have got clean clothes for the week and clean dishes to eat from so that's all nice too. But it did sound like they had a lot of fun! By Monday I was itching to get out there and commodore emeritus Tony P had planned a trip that sounded like a perfect recovery paddle after last week's marathon - in honor of the current Triple Crown madness, he'd called for a paddle to Dead Horse Bay. It was a great day, a nice group, a nice leisurely paddle, about eight and a half miles in total, with a long break in the middle for lunch, beachcombing, hiking, and even a little history. It was a gorgeous day, naturally I took my camera, and there's a full photo trip report up on Flickr - click here to visit. How Much Do I Love Rounding the Northern Tip of Manhattan? If number of photos taken is in direct proportion - evidently a lot! "Yep! I was wondering if that was you but I couldn't really stop, I was taking so many pictures going around the northern tip of Manhattan that I was lagging behind, and we had a bit of that thing that you get when you turn a horse back towards the barn going on. That bit where you come around the corner at Columbia has always been a particular favorite piece of a circumnavigation - the Harlem is sort of confined and industrial and you're on it for a while then you come around the corner after the MTA bridge and ahhh, everything just opens out - I got utterly silly taking pictures every 30 seconds or something!" Then I reassured people that I hadn't posted all of them in the trip gallery (it's still an endurance event in and of itself but I actually did edit things down a lot) - but then I started wondering how many pictures I'd actually taken in that section. Answer: This many. Click on the first one for a better view & go through slide-show style. Click here for the full Flickr gallery. Now getting through the whole thing may be a feat of endurance, but so was paddling 32 miles in mid-May, and I did actually do captions to help lead you through. This was the first time I've done a Manhattan circumnavigation with a digital camera and it was fun actually documenting most of the full loop. Hope you enjoy the pictures! Oh, notable feature of the day - first paddle of the year without a drysuit. Yowza! Spring is sprung! And now that I have your attention - ha ha, guess what, too pooped to write it up! 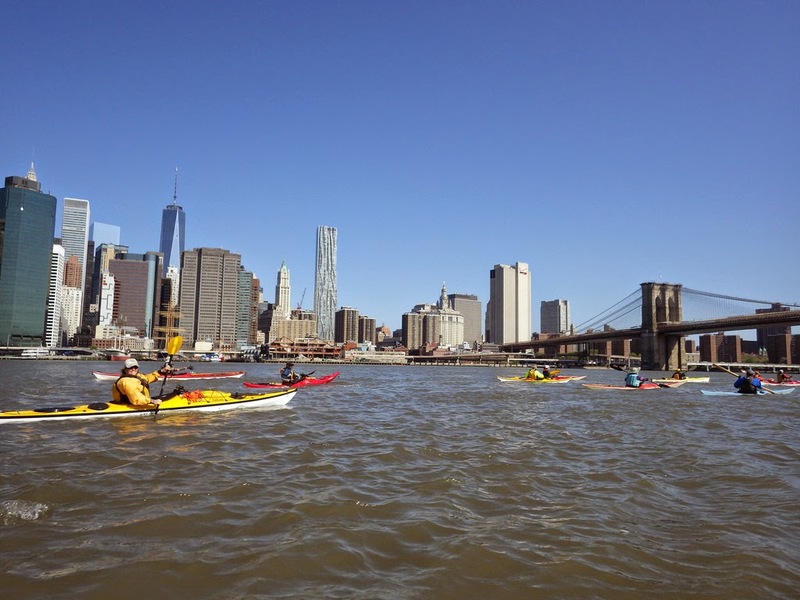 30 miles (26 around plus a couple of miles to and from Red Hook, Brooklyn, where we launched) is a incredibly ambitious paddle this early in the season. Gorgeous day on the water though, if very very tiring. I think this was my favorite photo of the day - we'd just gotten to Battery Park, so we were in the home stretch, which was great; there's the Statue of Liberty in the background, and beyond the Sebago paddlers, there's the schooner America 2.0 having a grand sail. Actually it felt more like summertime this weekend - highs in the low 80's, and some summer-type thunderstorms on Saturday. Sunday was absolutely gorgeous, could've been a lovely boating day but I decided I really wanted to get my garden planted instead. At one point a wetsuit did end up in my backpack, just in case, but then I realized that gardening is always one of those things that always ends up taking me more time than I think it's going to, so I took the wetsuit back out. First stop was Dragonetti's, the garden supply shop on Ralph Avenue that ends up getting most of my gardening money for the simple reason that they're with easy walking distance of the club, just about a mile. I look for a ride when I'm getting soil to refresh the bed (insert annual "Dirt cheap? No, dirt expensive" joke here), but when it's time to get the seeds and seedlings, I bring a big shopping bag with handles from home and I can carry everything I need to the club that way. The walk to the club up Paerdegat Avenue North has gotten much nicer as the NYC Parks Department has been slowly working on a park that runs along the basin from the end up to around Paerdegat 10, where the boating clubs start. The park has developed slowly, I think it's something that the Parks Department sends people to work on when things are slow, but the tract of land has gradually gone from dense, weedy scrub that people just used as a dumping ground to a nice combination of open land, patches of trees, and ponds. It's not open to humans yet but this family of Canada geese certainly looked like they are appreciating the change. First baby waterfowl I've seen this year! After a quick break to get that picture, I headed on down to the club. Here's this year's assortment: 3 kinds of tomatoes (Mr. Stripey, Tigerella, and, uh, another one), cucumbers, basil, and then Swiss chard and beet seeds. Also trying to get the herb bucket going again with rosemary, sage and thyme - that was a combo that had survive a few winters, but being inundated in seawater was was too much for them; I did try to restart this last year but they didn't take; giving it another shot this year. Oh, and I got a Scotch bonnet pepper 'cause TQ loves hot peppers (and I like 'em myself in moderation). Other than the pepper, pretty much same old same old, I'm not very adventurous with my gardening, I have been doing this long enough now that I've got a layout that works pretty well & provides a nice steady assortment of fresh stuff over the summer. The tomatoes are all experiments, I haven't ever quite settled on any particular type as my favorites yet. I did also throw in some ageratum seeds that have been sitting in a drawer in the kitchen for who knows how long - I love ageratum's fluffy blue flowers. Oh, that reminds me I should try to get a cosmo going again too - I had a positive thicket of those my first year of gardening, before I realized that I really prefer growing food to growing flower - I pulled 'em out but I always had one that came up next to the onions and gave a really nice show in the fall. That one also didn't make it - the onions were the only thing tough enough to shake off Sandy. With all the rain we've had in the 2 weeks since I got the bed ready, a nice haze of tiny green weed leaves had surfaced - when I saw that, I was actually glad I'd left my wetsuit at home, I hardly think I got all of them but I did give the surface a light raking to pull them all up and then spent a good long time picking them out before I put my seedlings in. And speaking of flowers - I may not grow as many myself since I realized I prefer growing food, but T. in the next bed over always has a lovely assortment! I don't even know what these are but look how pretty. Boy, this is the sort of picture I would just find myself drooling over during this long, cold winter when a California or Hawaii friend would post some sort of floral festiveness on Facebook - ooooh, color! So nice to have the color back here again. Oysters and Scallops and Clams, Oh My! Tonight's doodle is in honor of a Sustainable Seafood Week cruise thingy I'm going on on Saturday with a friend from Sebago. I'm psyched. Check it out! Quickest of lunchtime posts today to mention that The Art of Brooklyn Film Festival is showing The Graves of Arthur Kill, along with a few other very interesting-looking short documentaries, this Wednesday at 7 pm at the Brooklyn Heights Cinema. The half-hour film, produced by Gary Kane of 3 Fish Productions and directed by Will Van Dorp of the world-famous Tugster blog, gives a look at the history and mystery of Staten Island's Witte Marine Salvage Yard, better known to local small craft enthusiasts as the Staten Island Graveyard of Ships. We had a screening at Sebago, Will and Gary did a wonderful job! Click here for more details and a link to buy tickets.